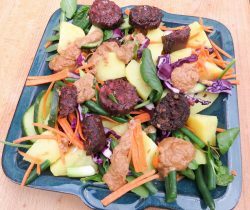 Vegan Black Pudding Gado Gado Salad afresh take on an Indonesian salad dish by Our Lizzy, Ready in 30 minutes. Blanch the cabbage and green beans. Drain and place on a serving plate with the other vegetables. Place vegetables in a serving dish and top with the V Pud drizzle with peanut sauce.